Every once in a while a new plant group hits the market and its popularity really takes off. In recent years this happened in the succulent world with a group of intergeneric hybrid succulent lilies that have been given the marketing name Mangave and botanical nothogenus name x Mangave. This name came about as these plants are a cross between plants in the closely related genera, Manfreda and Agave, now placed in the subfamily Agavoideae within the Asparagus family, the Asparagaceae. Though some recent treatments lump these two genera and tuberose (Polianthes) together into the monophyletic Agave clade in the genus Agave based on molecular and genetic evidence, others maintain them as distinct genera. Since Manfreda and Agave and the hybrids between the two are quite different for horticultural puposes, we continue to differentiate between them and call these hybrids x Mangave. These mangaves plants are often quite showy and have inherited great qualities from both parents with the agave parent often lending its durability, larger size and architectural form, while the manfreda parent often gives them flexible leaves with red markings or spots and softer teeth and spines that makes them much easier to handle and not dangerous to pets and people in the garden. What a great combination! San Marcos Growers has long been interested in these great plants since first listing x Mangave 'Macho Mocha' in 2005. Macho Mocha was introduced in 2004 by Carl Schoenfeld of Yucca Do Nursery in Waller, Texas, an amazing nursery that unfortunately is now closed. This plant was from wild collected seed on Manfreda variegata and is thought to be the result of hybridization with Agave celsii [A. mitis] as this agave was growing nearby to where the seed was collected on the manfreda. Once the plant was recognized as a hybrid, Carl Schoenfeld and Tony Advent of Plant Delights Nursery came up with the nothogenus (indicating a name for an intergeneric hybrid) x Mangave to describe it, though we note that the name x Mangave is credited to a Dirk Klein five years later on the International Plant Name Index. Following shortly on 'Mocho Mocha's footsteps was x Mangave 'Bloodspot', which we started growing at San Marcos Growers in 2008. 'Bloodspot reportedly originated in Japan as the result of crossing Agave macroacantha with Manfreda maculosa. We continue to grow these two early Mangave but they were just the tip of the Mangave iceberg. About ten years after Macho Mocha, hit the market we began to see a profusion of great new Mangave cultivars coming from the breeding work of Hans Hansen at Walters Gardens. We were well aquaited with Hans' work on Agave, as he had produced many great plants for us and others in the micropropagation laboratory at Shady Oaks Nursery in Waseca, Minnesota. In fact, our first crops of 'Macho Mocha' and 'Bloodspot' were from him. 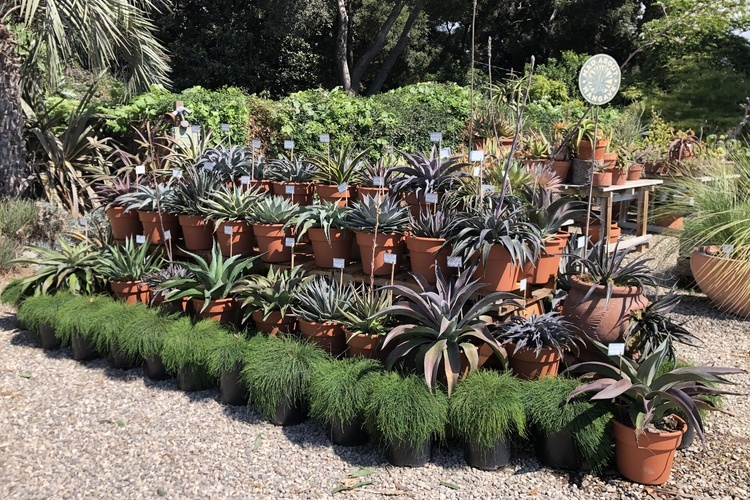 Though Shady Oaks in no longer in operation, we were thrilled that Hans maintained his interest in these succulent lilies when he continued his breeding work at Walters Gardens, and and we are now growing many of Hans' new mangave plants and trialing others. 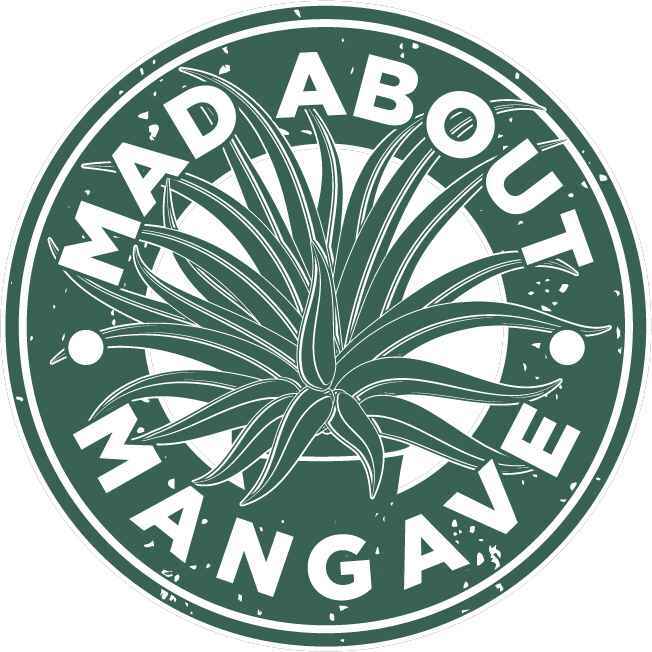 Likely there will be many more great ones to come and, like Hans, we are Mad About Mangave®! x Hansara 'Jumping Jacks' PPAF - a tri-generic hybrid! x Mangave 'Macho Mocha'The first Mangave!